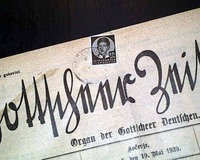 GOSSCHLEER ZEITUNG, [Gosschleer Newspaper] "Organ der Gottlcheer Deutschen" [Organ of the German Gottscheers], 1939 This was a newspaper from a former German-speaking region in Carniola, a crownland of the Habsburg Empire, present-day Slovenia. 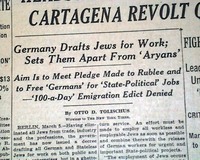 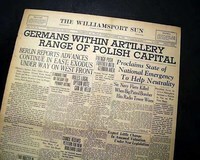 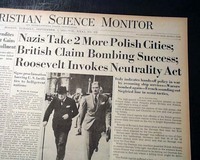 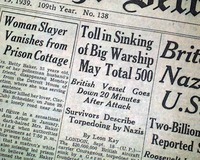 Other news of the day with more on the early stages of World War II. 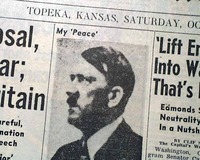 This 18 page newspaper has a three column headline on the front page: "Hitler Offers Peace Proposal, Threatens Destructive War; 'Nothing Changed' says Britain" with subheads and photo of Hitler (see images). 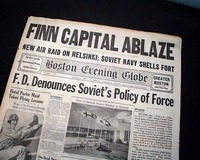 This 44 page newspaper has a great banner headline above the masthead on the front page: "FINN CAPITAL ABLAZE" and more. 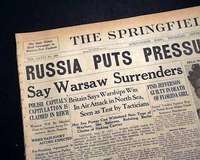 This is coverage on the bombing of Helsinki, Finland by Russia. 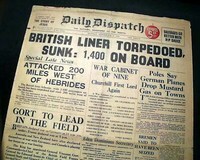 Nice item for display.